This is somewhat similar to using the Internet, you're using equipment that someone else operates and has paid for to enable you to communicate. Yes, you can use the hand-held or base/mobile radio to communicate directly, but you can't go nearly as far. A problem comes when that someone won't or can't keep the repeater operating or maybe won't let you use it. Operating a Repeater isn't a cheap operation, there's the electric bill to pay. Often the operator has to pay rent on the space that the equipment is located in and also for the space that the antenna occupies on the tower. The equipment itself isn't cheap. That said, I operate several repeaters and happen to have them located at my house. I'm located on top of a ridge at 1400 feet altitude north of Eugene, Oregon. I have repeaters on the 6 Meter, 2 Meter and 70 Centimeter bands. I also operate equipment for a Packet Radio Bulletin Board and a WinLink Internet Gateway system. Everything has battery backup that will last nearly a week with careful use and soon will also have Solar Power backup. 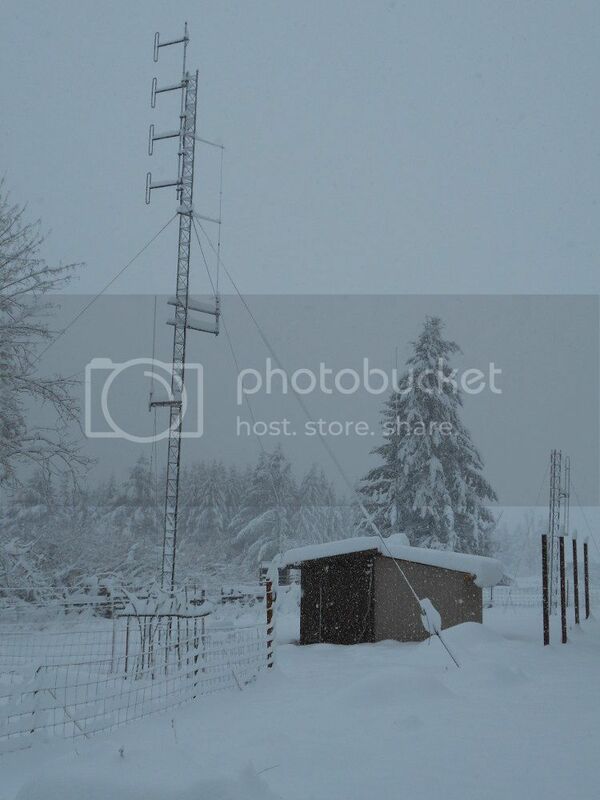 The photo at the top of this post is of the building and tower for my Repeater equipment. Compare this with how a new Ham got on the air back in the 1970's and before. You'd either build or buy a simple transmitter and receiver that worked on the HF (High-Frequency) bands between about 15 and 80 Meters (3.5 to 21 Mhz). You'd string up a wire antenna and hook it to the rig (Hams call their radio equipment their rig). Any of these frequencies are capable of communicating worldwide without any repeaters. From communicating across town to communicating with someone halfway around the world, you didn't depend on anyone else except the person you were communicating with. Now there is a difference, when you're using a 2 Meter radio, the reliability of your communications is quite high. You are using line-of-sight paths and when there's nothing in the way everything works well. HF communications depends on the signal bouncing off the earth and the upper layers of the atmosphere to get from one place top another. Things don't always cooperate, so the reliability is not as good. You have to know what frequencies work best at certain times of the day and certain times of the year. Sometimes nothing works. however HF can communicate over much longer distances. I guess where I’m heading with this is; as a Green Wizard, how do you want to make use of Ham Radio? If you are interested in participating in the traditional local Public Service, helping out in local activities and getting to know local Emergency Services organizations, the first way is the one for you. Also for local communications using Repeaters or direct simplex, the VHF and UHF radios work well. If you are interested in keeping alive the knowledge of how to communicate using simple, easy to build from scratch equipment, you might also want to explore the older path I mentioned. You’ll find that nobody builds their own of the type of rigs to use for VHF communications on the local repeaters but there is lots of re-purposing older commercial VHF and UHF equipment for use on the Ham Bands. There are still many who build their own HF equipment, the Ham Radio magazines are still quite full of articles telling how. Often tubes are still used! Transistors can be scrounged from many different pieces of cast off electronics. I think we will need both VHF/UHF and HF communications. VHF/UHF local radio, with and without repeaters, to replace and augment the telephone system with local "party line" communications for local communities out to the county level, and HF radio to stitch all those places together. I would also hope that we can evolve a radiotelegraph service, either commercial or public, patterned after the amateur radio NTS, but hopefully outside of the amateur radio service so business traffic can happen. I think the way for Green Wizards getting started in Ham Radio is definitely the VHF/UHF route. Then HF should be added as they progress. There's definitely going to have to be a "service" outside Ham Radio to handle business and similar traffic. I think that the time for this to develop is not in the very near future, but the skills need to be preserved. I see that as the ARRL seemingly lost interest in traffic handling and NTS, RRI Radio Relay International was formed by former NTS people for just that reason. Thanks for posting this. I may not have the time right now to get into ham radio but its nice to know that when I do, I'll have it all laid out for me. Great article August! I just sent you a message via Winlink! I think exploring both ways is good for where we are at now, if you have the time & ability. I am working with an ares group with all the vhf/uhf stuff, and then with some friends in the radio club, doing an informal study of electronics. The past few weeks though I've been doing a lot of writing for a reading I'm giving -part of the storytelling aspect of Green Wizardry, and also got all our seeds started -including milkweed- for the garden. So finding the time to work on all the different things can be a bit of challenge as I have a 9-5 as well (which I'm grateful for, and love, since its at the library). But I think a lot of folks here could at least get their tech licenses and get on local repeaters and start building that network. A lot of hams are good folk to know because they are already into working with solar power, back up power, being self-reliant. A lot are preppers etc. Another great thing about ham radio I'll mention here is the community. I've made a lot of friends locally and around the country & in the UK from the hobby. Some of the friendliest people I've met, & really ready to help you succeed. There are lots of kindred spirits out there for Green Wizards in the ham community. Justin mentions the friendliness of hams, and I think it may be because we know that we've all taken the initiative to study for and pass the exams. There's a certain amount of exclusivity to it that doesn't depend on "who you know" or "where you're from", but just from getting through the licensing process. This is not to claim that hams ALWAYS treat each other with dignified respect. Scan the bands long enough, and you'll hear venom and vulgarity. But most of the time, hams are eager to recruit and advance the skills of others. And you can't work HF without paying due respect to the Earth and the Sun, and the ionized gases that surround them.